Interested to explore a career as an Entrepreneur? Today we bring to you second interview with N K Narasimhan, one of the founder’s of Nascor Technologies (http://www.nascorgroup.com). Ex-employee of L & T, Sun Microsystems and Yahoo! who has over two decades of work experience under our unique section ‘Test it’! For more information keep a tab at this page (https://www.facebook.com/Without.interview). You may feel free to post your question in message box or comment and the interviewee would answer over the next few days from 03 Jan 2015 till 07 Jan 2015. We hope you have a great career ahead! Author: Tell us about your background and education. Narasimhan: I completed my engineering in Industrial & Production from SJCE, Mysore, finishing as a College Topper throughout and with rank 7 for the University of Mysore. Author: How did you land in an IT job? Narasimhan: I started programming with widely known as BASIC (an acronym for Beginner’s All-purpose Symbolic Instruction Code) while studying PUC (1985-86) using Casio PB 100 which supported a condensed BASIC version for programming. My brother was a great influencers who was pursuing engineering. I eventually joined engineering at SJCE, Mysore and FORTRAN was the language that existed as first year course. I took to learn ‘C’ in my second year. There used to be one hour slot given for each one to book to do Unix & C programming in Computer Science Lab. Lot of times, used to get midnight slots. Our final year project was a software cross assembler & a post processor for CNC machine with a graphics editor which caught the attention of the examiner. The complexity, effort & contribution was highly appreciated which was a big milestone for a graduate student. Through campus interview, I was placed in L & T and worked on rotational initially but one of manager put me into Test automation involving mechatronics. With help from seniors, contributed in various projects using machine language, Turbo C, C++ and Microsoft Visual C++ 4.2. After six years of working with L&T moved to Yokogawa that was in and out into software product development – worked on system software, server development etc., rising up the ranks, this further continued at Sun Microsystems and Yahoo!. Author: You have worked as a tester and developer role. How is your overall years of experience? Narasimhan: Sun Microsystems was the place of transition from development to testing. I started looking into quality. This also waved a path from individual contributor to manager (engineering) and this continued at Yahoo! Both companies had different view on testing and i believed that development & testing as two sides of the same coin, hand in glove, spearheading to brand as ‘Quality Engineering’, ( always question ‘how to engineer quality into software products’ ) and engineer’s as QE. (Quality Engineer). This helped me to be versatile, (able to wear different hats) critique my deliverables too. Perhaps this gave birth to duality. Also, this allowed me to hire the best candidates from institutions such as IISc, Bengaluru. Me & my QE team at Sun developed SIFT (Sun one integrated frame-work for testing ) that helped to simulate failures and emulate complex, real world user scenarios. Over time, adoption among different teams increased, emerging as a versatile Test automation development platform of choice within the Sun community. Author: What are your views on being a tester or a developer? Narasimhan: (Thinks) The demarcation is unhealthy. If one need to be a good tester, then the aspirant has to be a good developer. It’s vice-versa as well. One who could be critic of his own work and welcome feedback from others. Preferably to start as a developer for some years because, it is maturity that is needed to become a tester. Testing skills are better honed while being a developer. This makes a best tester and evolves to ‘engineer’ Quality. Sometimes, Creativity & Innovation needed to test a product is more complex & interesting than development of a product itself. There is an ‘I‘ in QUAL’I’TY and Creative bend of mind is equally needed for a tester. I feel, both cannot be differentiated in a physical way and every organisation adopts their own approach to bring in distinction & differentiation. Author: Could you give insights on being an entrepreneur? Narasimhan: Survival, sustain and beyond is something that one need to look forward. Can you translate an idea to a business? In other terms do you have a business case? If the answer is yes, then its worth a risk. Business case need not have an innovation but can satisfy a need. There could be micro level changes in terms of innovation for the requirement or even create a need. If an idea is really unique or has a business case, then its Google for you! Even timing, being in the right place & right time matters. Good examples like Flipkart, RedBus, Xiaomi etc. Author: What are your hobbies? Narasimhan: One thing I always have been doing is – ‘give life, extend the life of any object’. This means I repair things (reduce wastage, resource utilisation) and it has been a natural activity right from my childhood days. This has immensely helped me acquire newer skills, like delve on – how it works, why, how, design intent, perspective, understand the thought process of the innovator etc. Apart from that reading technical and philosophical books is something that keeps me glued. Author: How did you find ‘Get a Job WITHOUT an Interview’ book helpful to aspiring software engineers and IT professionals? Narasimhan: This is a must read for every grad aspiring to work for renowned product company biggies. Easy reading, gives a lot of insight about big companies, concise, covering all perspectives in 80+ pages. When i was going through “Impression” (section 9), I was recollecting, an article stating based on studies & surveys, an interviewer makes a +ve or -ve impression in the first few seconds and the rest of the interview will be to self validate/justify his opinions about the aspiring candidate. As an age old saying goes, making the ‘best’ first impression is important. In my experience, I have come across such interviewers. In this context, I liked the coverage under “impressions” which candidates tend to ignore or overlook. Also, change is a constant and candidates should iterate on Annexure 1 & 2 – ways to learn & how to learn, to achieve & sustain a positive career trajectory. Nascor Technologies, Bangalore, (http://www.nascorgroup.com) is a Software product Start-up, in pursuit of Transforming email platforms to deliver email users VALUE beyond ‘just’ Communication. Email usage & overload is on the rise. A working individual spends an average 28% time on emails. Nascor with its vision, aims to touch every emailer on the globe, alleviate their pain points by providing products & solutions, by making emailing easy with intuitive, innovative, productivity tools to manage ones work and emails too. Nascor’s tZirrTM (pronounced as teaser ) has five high impactful productivity features, downloadable for emailers to experience on Microsoft Outlook. Nascor’s U@Work (patent pending) is a top line product, currently under development designed to offers a light weight solution for any business operation, to manage ones work and as a group collaboratively ‘manage work’ covering projects, activities, resources, meetings, tasks etc. Readers – aspiring software engineer’s , IT professionals and entrepreneur’s are free to leave your message for Narasimhan to answer on or before 07 Jan, 2015. We hope you are enjoying this section, feel free to leave your message for us to improve. Next week we shall bring to you another personality of a Top company. We wish you a great new year 2015. Till then, ‘Test IT’! In the part 1 I discussed about the beginning of idea (incase you missed to read – Part 1). I spoke to most of the students who went through various rounds of interviews to get insights from recruiter perspective that be a technical test, technical interview, case based interviews, group discussion and HR interviews. I tried to connect those points to the job description and role projection after several years. This analogy seemed to me a short-term objective the way students prepared for campus recruitment and similar thing from hiring perspective. Even today it continue to remain same across many industries. I call it as ‘Pain-Oientiment’ relationship. This exercise to put those points took almost two years. This has continue to remain on board for refinement to help for interview preparation in the present and future writings. In the next article I will present how Indian marriages has helped the first chapter to shape and happen. The first copy of the book was opened by Dr.Meena R Chandavarkar, Vice Chancellor, Karnataka State Women’s University, Bijapur. The book launch activity was held at Cuppa Koramangala, Bengaluru – the launch was done by N K Narasimhan,CEO and Founder, Nascor Technologies (former employee of Yahoo!, Sun Microsystem, L&T),Bengaluru; Darshan, Businessman; Philip K, Franchise owner of Cuppa Koramangala, Bengaluru attended by motivators (friends). Authors view (Santosh Avvannavar and Raghavendra Kumar Reddy): The idea to project took nearly 7 years (writing and publication took nearly 2 years), we were always fascinated with the slick book that were clear, specific and precise (minimal filler). An unconventional book that is likely to break the Q & A format and provide a framework to begin. Why such book are important for a long-term career goal? The idea of this book started during 2006 while I saw M.Tech/M.S. students waiting outside the placement cell for job interviews. I slowly moved into a role known as ‘Placement President’ through Student Cell at IISc, Bengaluru to act as a mediator between placement cell and the institute. There were about 60 companies that participated for campus drive, I sat through most of the presentation that was delivered by technical representative and HR representative. This broaden my horizon of understanding the role that they looked for each business unit. Each IT company picked countable number of students for a specific role. What I admire also about many students was that they had clarity in picking a role and company that would help them to grow. It was more of a long-term goal. I still remember that students saying NO to an offer because their determination to work for a specific technologies rather than just an offer. This I would term as self-awareness. Various such incidents lead to the beginning of ‘Get a Job WITHOUT an Interview – Google & Beyond’. In the next article I will bring to you how the idea (brain) to board (paper) began. 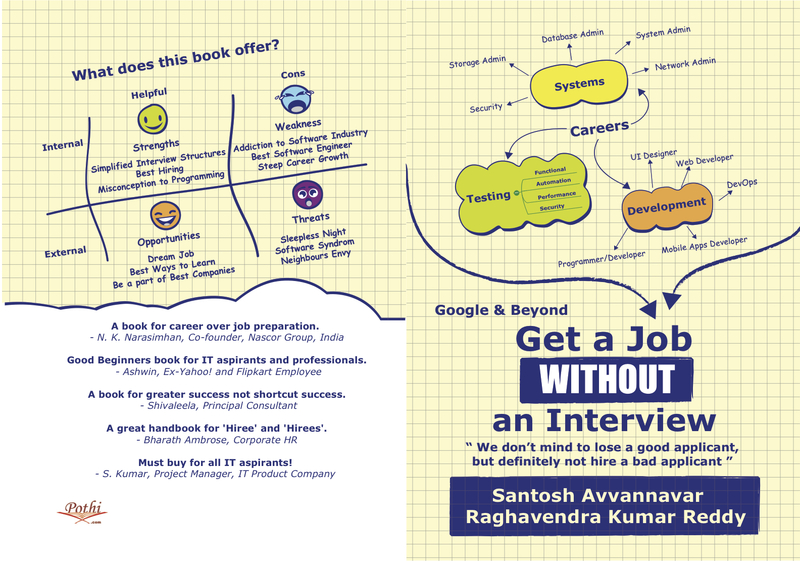 Book Review: “Get a Job WITHOUT an Interview”-Google & Beyond! It feels happy that such a creation has been come up, firstly Congratulations! & Good luck! I am delighted to review this book. The book has enormous information to communicate, although it’s small & handy. It is easy to read & draw the concepts. The book has removed the illusions of people that small books with less pages fail to convey enough thoughts, it has created one such milestone now. The book talks about the practical ways of managing your career by focusing on the basic and long term fundamentals.Best pick for the college students and professionals who are planning for a better career opportunity/growth. Thank you for synthesizing preety much everything live/real in a way, a graduate or a student need it. A very good narration of live example for the need for hire. and cool way of showing the importance of focusing on eternal career. A fab way of presentation and the technical aspects are bound to this book. The first copy of the book was opened by Dr.Meena R Chandavarkar, Vice Chancellor, Karnataka State Women’s University, Bijapur. The book launch activity was held at Cuppa Koramangala, Bengaluru – the launch was done by N K Narasimhan,CEO and Founder, Nascor Technologies (former employee of Yahoo!, Sun Microsystem, L&T),Bengaluru; Darshan, Businessman; Philip K, Franchise owner of Cuppa Koramangala, Bengaluru attended by motivators (friends). What’s motivation behind this book? Our research and close observation of the job interviewing process for graduates at Indian Institute of Science, Bengaluru during 2008 and 2009 for nearly 500 students in various companies, is the inspiration for this book. How did the book shape? The idea of book all began seven years ago; gathering information and compilation took one year, writing clear and concise manuscript took one and half year, revisions, addition, debate, arguments and others took another 6 months, decision of publisher and publication took another year. You see it takes a toll to convert an idea into a project! How different is this book? This book is intended to help people just not only to crack interviews, but build career. We have tried to emphasizes on need of hour and future dynamics of hiring process that industry is witnessing and rapidly changes that will take place in best of the companies. We hope to break the conventional learning methodology through this book. Who all should read this book? The book cover page and content might reflect that it’s for IT aspirants, but the book intends to give away for all the industry. IT industry begin an interdisciplinary, it might an important book to look forward. We authors believe that it’s a book for a long term. Readers will also find that it’s simple read, easy to understand and some chapter would seem hilarious. Can you provide us link to order the book? The book will also available at other portals in few weeks. We request your encouragement, and support! Santa Santosh Avvannavar author of Adhuri Prem Kahaniya, Dear Wife, Your Husband is not a Superhero and Second Heart will launch 4th book this July ‘Get a Job without an Interview’ at your favourite bookstores! ‘Get a Job without an Interview’ at your favourite bookstores!